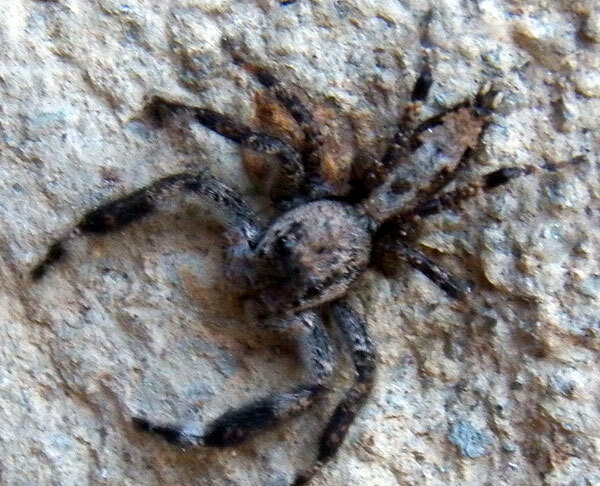 This jumping spider was found actively hunting on the shady side of a block wall of a house. Eldoret, Kenya, January 2012. Jumping Spiders are among the coolest animals in Kenya and the World! Don't take my word for it. Spend some time watching and understanding how these finely tuned predators make their living. Start with exquisite eyesite, a hallmark of many top predators. Instead of two eyes, jumping spiders have eight with each pair assigned a specific task. The largest pair have huge lenses and the ability to move the retina (light sensitive plate) backward and forward like an expensive camera. Agility in movement including stealth, top speeds and of course the ability to jump with astonishing accuracy. There are volumes written about these spiders. Explore them in your yard or favorite vacation spot. Start via the Internet using the links below. This might be the same species of Holcolaetis as the spider at left. 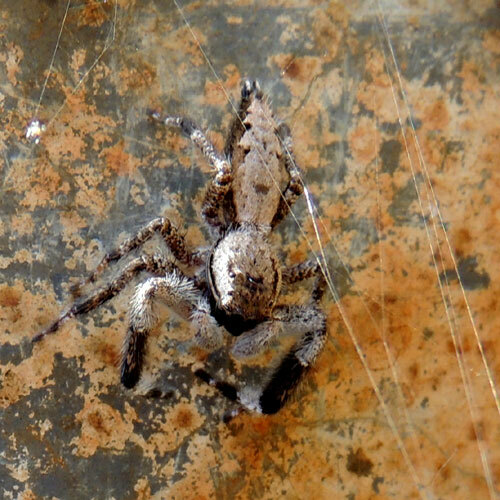 It was found waiting at the entrance to a funnel-web spider's (Agelenidae) lair built between sheet metal walls around a kitchen; presumably this jumping spider will attempt to predate the agelenid spider when it emerges to catch a fly, its usual prey. On the other hand, it this specimen appears to be a male and thus might be awaiting the appearance of a female looking for its own a meal. Eldoret, Kenya, December 2012. Communications with J.B. Edwards and Robert Jackson helpful in understanding this dynamic relationship.